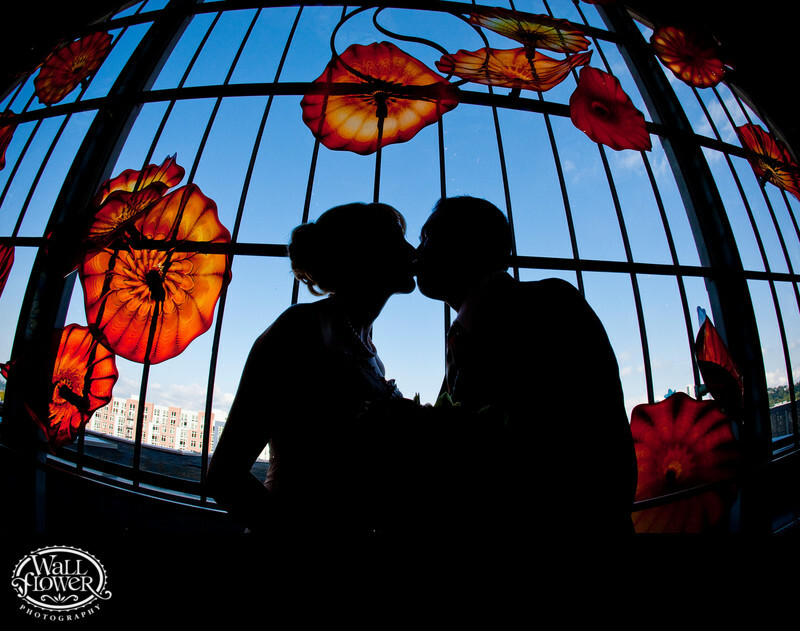 I shot this silhouette portrait of a bride and groom with my 15mm fisheye lens to get its characteristic line-bending effect across the Monarch Window's grid of straight lines. This window is a focal point of the Union Station Rotunda in downtown Tacoma, Washington, which was originally a fancy train station. The historic window is decorated with large orange art glass sculptures by world-famous artist Dale Chihuly. To see lots of photos of this wedding, and of other weddings photographed by Wallflower Photography at this venue, visit our Tacoma Union Station wedding portfolio website at www.tacomaunionstationwedding.com.